Cats Incredible™ Lavender 14 lb Clumping Cat Litter has Smell Squasher™ technology that actually prevents ammonia from forming in the litter box. Virtually no dust, low tracking. Beautiful, patent pending ergonomic double-handled packaging with an easy-to-pour spout. Non-toxic, long lasting formula. Made in the USA. We use a super premium sodium bentonite clumping clay from the USA which produces firm, easy-to-scoop clumps and is 99.9% dust-free. Our Lavender formula includes a light lavender scent. 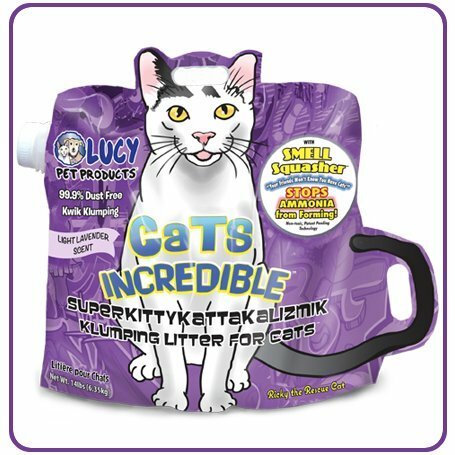 We DO NOT use a heavy fragrance (like most brands) to cover up the ammonia smell in the litter box because ammonia won’t ever form. Veterinarian Approved. Non-toxic, safe for cats and kittens. Beautiful, patent-pending cat shaped bag with two ergonomic handles and a side spout that makes it easy to pour. Features front and back of “Ricky the Rescue Cat”. This bag is recyclable and non-pollutant, so please recycle when finished.